There’s not that much to this recipe really, it’s just a case of throwing all of the ingredients into the slow cooker and letting it do all of the hard work by bubbling and popping away all day while you’re out of the house. I served my beef and Guinness casserole with generous dollops of buttery mashed potato and thyme glazed carrots, but you can serve it with whatever you fancy. I should also point out that Guinness is not gluten-free because it is brewed from barley, so don’t use it if you’re coeliac or are highly sensitive to gluten. However, there are many gluten-free beers available nowadays, so a look in your local supermarket or online will undoubtedly uncover some gluten-free options for you to use in this recipe. I think this beef and Guinness casserole goes very well with creamy, buttered mashed potato and carrots which have been gently steamed until tender and then glazed with melted thyme-infused butter. 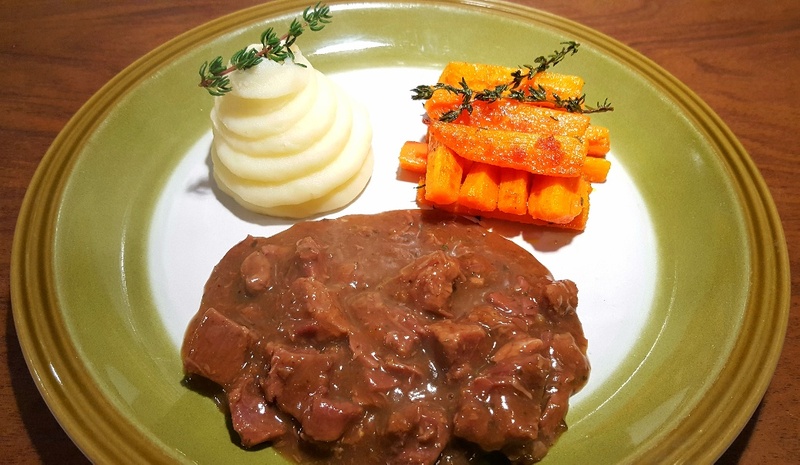 The mash helps mop up the rich beef gravy of the casserole and the thyme flavour of the sweet buttered carrots just marries really well overall. It’s a meal which will definitely help you to chase the winter away. Coat the beef in the flour and then put the beef and herbs in the slow cooker . Pour the can of Guinness into a microwavable jug and heat until boiling. Dissolve the two stock cubes into the Guinness and add to the slow cooker and cook throughout the day. Boil potatoes to make mashed potatoes and in the meantime make the glazed carrots. To make the thyme-glazed carrots steam or boil the carrots until just soft and drain. Melt the butter in a frying pan and add the thyme and carrots and fry until the butter has reduced and the carrots have a glaze on them. When you’re ready to eat, serve the beef and Guinness casserole with mashed potatoes and the glazed carrots.